While the alley to the left of my apartment tower is Egg Lady’s domain from sun up to late afternoon, sunset brings Corn Girl and her mobile cart into the alley at our right. 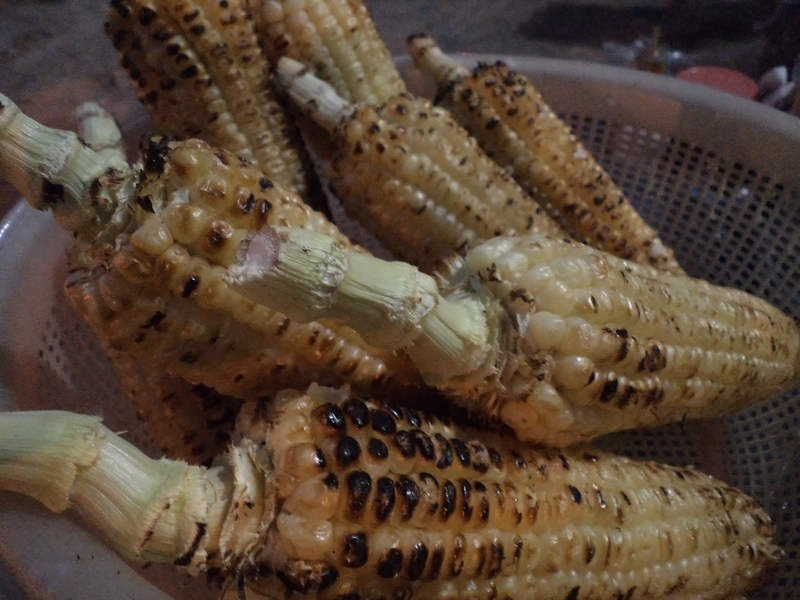 Two of my friends and a neighbor had assured me her corn and sweet potatoes grilled up streetside are both good and safe. Corn Girl with all her street cred and a few recommendations to boot now seemed a logical enough stop on this meandering food trail. And besides, who can mess up corn on a grill, and that searing heat most definitely kills any and all of those pesky petri dish creations making street vendors a hit or miss proposition. 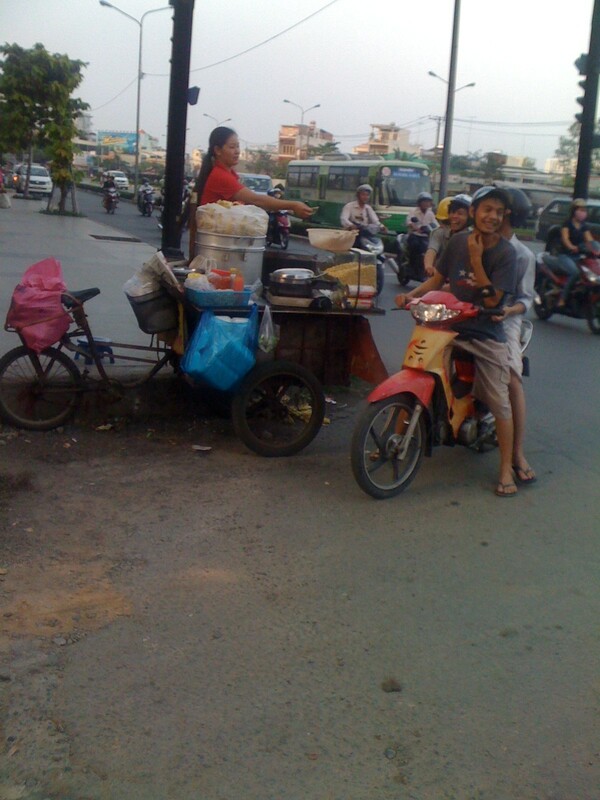 Or so I had myself convinced as I walked up to her stand right there on the corner of Nguyen Huu Canh Street. Now I have never been a big fan of corn on the cob in the US and I don’t quite know why I assumed any culinary epiphanies would rain from the food heavens in some dirty alley. Corn Girl carefully rotating the hot whitish-yellow ears with bare fingers an inch above glowing goals had me mesmerized by the sheer idiocy of not using a dollar pair of tongs for safety. The distraction of wondering how in the hell she doesn’t scorch her skin right off helped me momentarily forget this scene isn’t quite so sanitary either. Again, heat from a charcoal fire dispatches all germs I kept telling myself. I flinched a little as she picked the pieces up one by one and burnished them with used newspaper. Is this to remove the hairs or to impart flavor? Or maybe both? 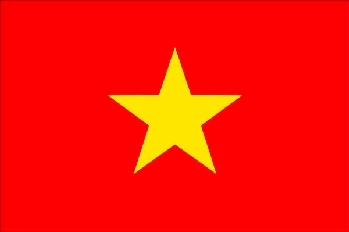 My lack of any meaningful Vietnamese vocabulary pretty much gums up any attempts to find out these sorts of things, and probably for the better. Some things in life are just on a need to know basis and this isn’t one of them. Thank Buddha, or whoever they thank over here, she placed the freshly newpaper-rubbed corn back on the grill for one more turn before dropping the finished product bare fingered into a bucket atop the cart. I didn’t even really notice how useful her bare hands are for handling money, rubbing her nose, and even cooking food since such a scene is my new non-American normal. But now that the thought is spinning in my head, has she never heard of tongs? The grocery store in my building a mere 500 feet away carries them so it’s not like we live in a world completely without the basics. On the way back to the elevator, I took a bite. The taste was not quite commensurate with the expectations I had built up in my head over the past couple of weeks. The dried out rubbery kernels lacking any firm texture were actually quite bland. Maybe Vietnamese corn is just different. Who knows. This friendly smiling girl could be producing the definitive end all be all of corn in Saigon for all I know. I tossed my 50 cent crap on the cobb into the trash can before even reaching the lobby. Oh well, such is life. Maybe I will try the sweet potato sometime. I am just not a corn person. Anthony, Thanks for the Vietnamese word for it. I changed the heading to include it.